A far cry from many of the eye-catching summits I’d visited in the past, there was nothing to greet me at the end of the road, save for Roz, who, as usual, had walked up the last 3 kilometres of the climb. An isolated resting place, made all the more numinous by its veil of mist, we felt as close to home as in our own backyard. For whatever reason, Angliru is in our psyche and it will forever remain there. Vive la France’ (‘Long live France’) would never be part of his vocabulary. Roz and I had some knowledge of French to fall back on, and a few words of Spanish. Later in the evening we were joined by another couple, apparently close friends of our hosts, who lived a kilometre down the road, in Pola de Lena. Immediately in high spirits, we were given the distinct impression that they got together quite regularly to share some moments of conversation and a few drinks around the bar. Using a medley of English, French and Spanish, and even charades when conventional language didn’t work, the six of us had loads of fun trying to help each other understand what it was we were trying to say. The subject of cycling came up many times throughout the evening. Patriotic about their mystical mountain, La Gamonal, and the Spanish cyclists who call the Asturias home, each of our new acquaintances told us they’d watched the Vuelta’s procession pass by on numerous occasions. A trifle inebriated, and having reached the part of the evening where assertion is used more often than tact, Roz made a throwaway reference to her dislike of Spanish cyclist Alberto Contador. A collective gasp went around the small room. Winner of all three Grand Tours, including the Vuelta a España on three occasions (2008, 2012 and 2014), Contador wasn’t just a favourite: he was god. No amount of foreign language excuses was going to save her, and the tone of the conversation suddenly became more serious. I dreaded the next comment, and from whose lips it might come. I just hoped it wouldn’t be from Roz. I feared her next words were going to be about the cyclist being stripped of his 2010 Tour de France and 2011 Giro d’ Italia titles, due to his ‘accidental’ ingestion of the banned doping product Clenbuterol. We both had our own views about food contamination being the cause, but this was not the time or place to air them. But she cut the growing awkwardness around the room like a scythe slicing through hay. Choosing her words more carefully than seconds earlier, she proclaimed a toast to Asturian rider Sammy Sánchez, who hails from the region’s capital city Oviedo. 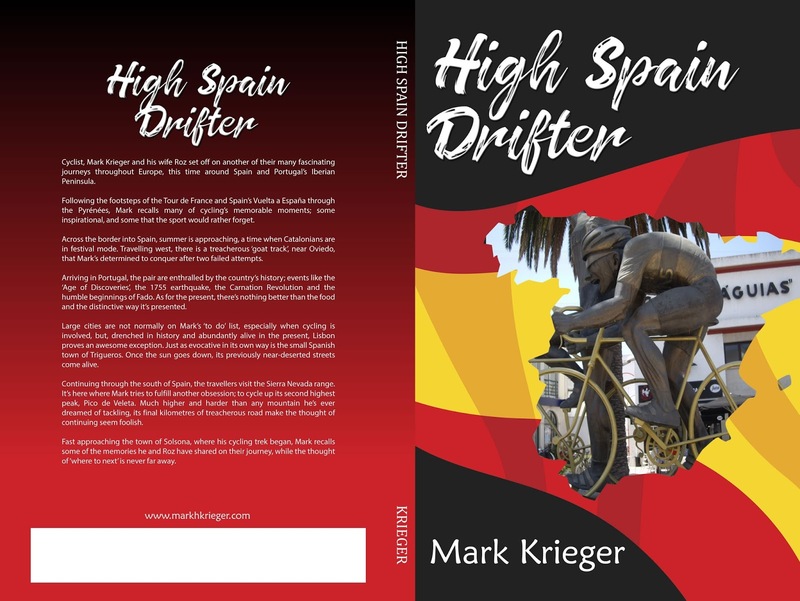 He was born just a 60-minute ride up the road and was one of the most popular cyclists in northern Spain, so it was a timely response. Rejoicing over another Spanish beer from Agustin’s wide collection, we continued on, almost until midnight. Though a little done in next morning, it was well worth it. Thanks to Sammy Sánchez and our wonderful hosts, we’d undoubtedly been treated to our best night’s entertainment so far. All six of the Vuelta a España’s visits to the summit of the Alto del Angliru have been via La Vega, the small capital of the municipality known as Riosa. 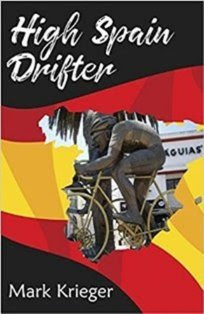 Something of a poor relation, at least in cycling terms, is the tiny village of Santa Eulalia, which lies 18 difficult kilometres to the north. With an average gradient of 7.9% over its 17.7 kilometres, it looks considerably easier on paper than its more favoured counterpart, but it doesn’t necessarily play out that way in reality. The first 11 kilometres of this route reminded me of climbing Italy’s Monte Zoncolan, from Priola. While to this point, the Spanish road is not half as steep, it is precariously narrow, pothole infested and surrounded by dense forest, engendering a feeling of isolation and claustrophobia. 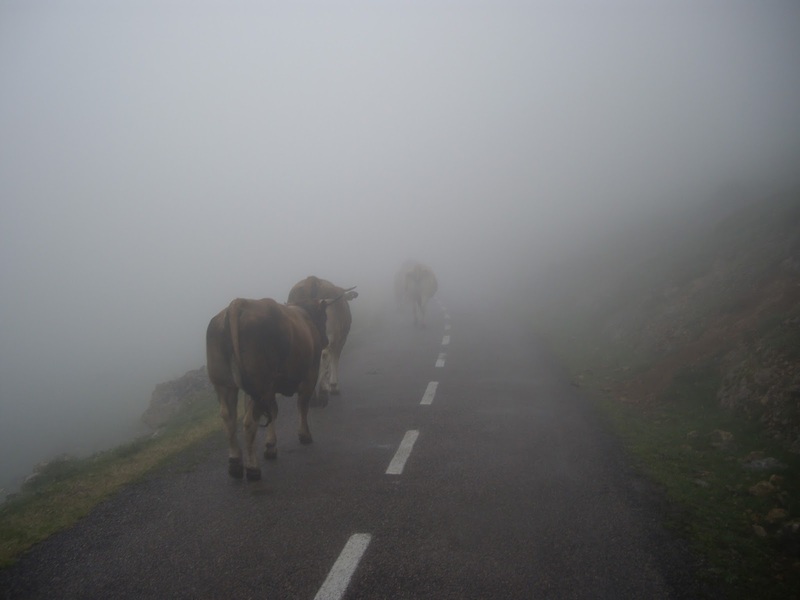 It soon became obvious why the Vuelta’s entourage prefers its more navigable and steeper alternative, from La Vega. But once the two roads converge, about 6 kilometres from the summit, just as they do on the French Tour’s legendary climb of Mont Ventoux, the gradient is horrendous. Doggedly ascending the steep zigzagging ramps for the second time in two days, I knew I would reach the summit. But with the 20%-plus gradients relentlessly re-appearing over the remaining few kilometres, it was still very difficult. Heaving for breath and with perspiration rolling off my face, I never lost sight of the fact that I wouldn’t have been up here without today’s sophisticated gearing systems, something the pioneer cyclists of the early Grand Tours never had the luxury of. Standing at the summit and admiring the view, I felt more satisfied than I had with just about any climb I’d done before. I remembered the first time Roz and I arrived at the bottom of the ascent in La Vega, in 2009, having spent the best part of the day trying to find it, amidst the network of narrow mountainous roads. Given the lateness of the day and with rain imminent, the last thing the overseer at the La Vega Tourist Office expected to see were two Australians seeking directions to the start of the climb. A crazy cattle track from whichever route you choose, it’s probably equally crazy – as I intimated earlier – that I bothered to come all this way to climb it once, let alone four times. Strangely, there’s some added motivation when you know exactly what to expect around almost every bend in the road. Whatever our passion, the idea of striving towards something that is not easily attained, even something as unimportant as climbing to the summit of Alto del Angliru, can be uplifting. At the very least, it’s a liberating diversion from what can become the routine of life.